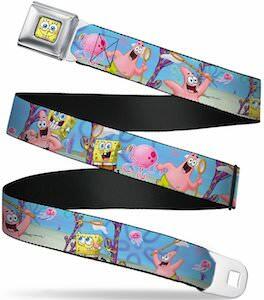 If your pants are sliding down then you just need this amazing looking Bob’s Burgers stained glass belt. 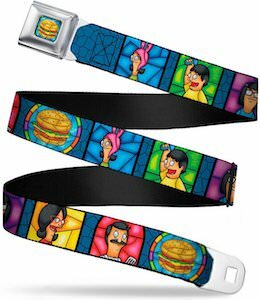 The seatbelt style of belt has a stained glass design with Bob, Linda, Tina, Gene, And Louise on it and also some burgers and all are bright in color and that really makes this belt look amazing. The Bob’s Burgers belt has a metal belt buckle with a burger on it and when you press the burger then the buckle get loose. 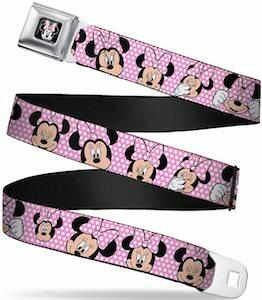 And you can get this colorful belt in 3 sizes so that it will fit the way you like a belt to fit. We can all use some help keeping our pants up and this MLP Rainbow Dash belt is perfect as it is an amazing belt and looks amazing too. 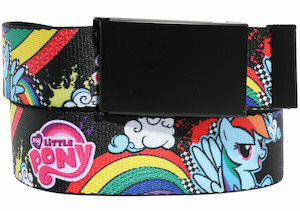 The My Little Pony belt has a black background and on it, you will find the pink My Little Pony logo and rainbows and yes, of course, many images of Rainbow Dash to as this is a Rainbow Dash Belt. The MLP belt is 1 1/2 inches wide so that it fits perfectly through the belt loops of your pants and that means you can keep your pants in place. Now you can wear your favorite pony with your all day long and it will make sure your pants will stay with you as well. 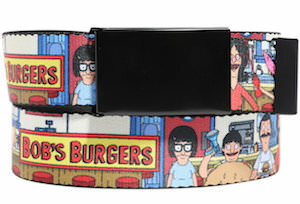 If you like Bob’s Burgers and need to hold up your pants then you need this Bob’s Burgers diner belt. The belt has a black buckle but the rest of the belt is real colorful because it has everything you can expect from a Bob’s Burgers belt. The belt shows the Bob’s Burgers restaurant and has the yellow and red logo on it and even Bob, Linda, Tina, Gene, and Louise on it. And Gene is even ready to party in his hamburger costume. So now you can have the whole Belcher family with you all day long and wearing this belt may make you hunger for hamburgers but at least your pants won’t fall off. If you like a cool belt buckle for your belt then you should get this Batman bronze logo belt buckle. The oval belt buckle is just amazing looking just thanks to the 3D design of the bat symbol that everyone knows that it is the Batman logo. You can use this Batman belt buckle with every standard belt made for belt buckles so that you can pick the perfect belt for your needs and you can mix it up to fit your needs. A buckle like this will look great with a black or brown belt thanks to the shiny bronze of the Batman belt buckle. If you want something cool to keep up your pants then you will need these The Nightmare Before Christmas suspenders. The suspenders are one size fits most as they are easily adjustable in size. The suspenders have a dark burgundy red background color with on top of that Jack Skellington. So no only is Jack great at keeping up your pants it also looks really cool which of course is just as important. 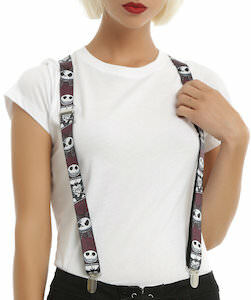 Men or women these suspenders of The Nightmare Before Christmas are just perfect for you. A Deadpool belt buckle is something every fan of this Marvel superhero needs as it just look stunning and is something that would look great as everyday wear or as part of a costume. 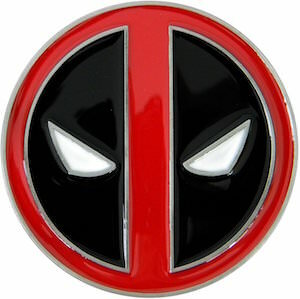 This round belt buckle is metal and has an enamel finish that gives it the typical red and black look we know so well from Deadpool. The Deadpool buckle has a diameter of 3 1/8 inch and works great with a nice leather belt that you already have with a boring buckle. With the red and black of this logo buckle you jeans will look great and I am sure that true Marvel fans will know what it is all about. This Game of Thrones belt buckle is just the perfect items for a true fans of the Stark family. The round metal belt buckle works just like any other belt buckle and fits most belts. 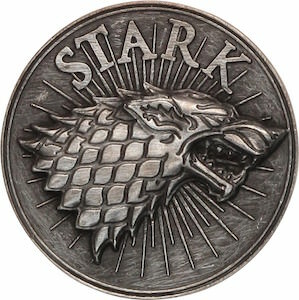 On the round metal you can see the Direwolf with lines coming from it going in the direction of the edge and above the wolf it says “Stark” as that of course is the house of choice. Wearing this Stark belt buckle will make you feel closer to Game of Thrones and that of course is a good thing as it is one of the most amazing shows on TV. 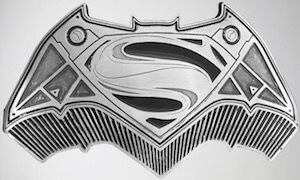 When you bring two bring two superhero’s together sparks could fly and that is what you can expect from Batman VS Superman and this belt buckle is all about that. This belt buckle is chrome in color and is shaped like the famous Batman logo but it’s not just Batman what you find on this belt buckle as in the middle of the buckle you can find the Superman logo and together that becomes the Batman VS Superman logo. Just put this great looking belt buckle on your belt and you are ready to show the world that is hard to choose between two amazing superhero’s.